Traditional speech and occupational therapies are key to children with a communication impairment, but don’t underestimate the power of animal assisted therapy. The use of pets – dogs, mostly, but also a few cats – in therapy goes back only to the 1960s. Today, pets are used to ease anxiety in hospital settings, help children who are anxious about learning to read, and for a number of other calming and esteem-building therapies for special needs children and adults. Studies of animal therapy have shown repeatedly that exposure to animals helps improve morale and communication, bolster self-esteem, calm anxiety – even reduce blood pressure and heart rate. And according to 2017 research from the University of Cambridge children get more satisfaction from relationships with their pets than with their brothers or sisters. Specific animal therapies can augment traditional physical, occupational or even speech therapy. Animals used in therapy help children, often with severe challenges, to feel better about themselves. 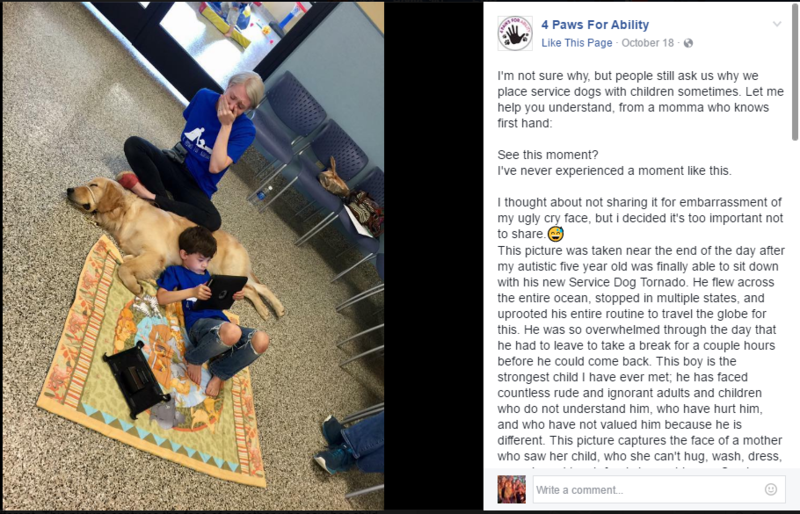 A clip of what the mom wrote on Facebook “I’m not sure why, but people still ask us why we place service dogs with children sometimes. Let me help you understand, from a momma who knows first hand: See this moment? I’ve never experienced a moment like this. This picture was taken near the end of the day after my autistic five year old was finally able to sit down with his new Service Dog Tornado…This picture captures the face of a mother who saw her child, who she can’t hug, wash, dress, snuggle and touch freely lay on his new Service dog of his own free will, with a purposeful unspoken attachment. This is the face of a mom who has seen her son experience countless failed social interactions on the playground in an attempt to have a friend. Any friend. Any kind of connection. She has sat with her son while he has cried at night for months because he has no consistent connections outside of the family no matter how hard he tries and no matter what he works hard on in his Autism therapies. It doesn’t transfer to the natural occurring world for him. And now she is sitting behind her son silently watching this moment, with the air sucked from her lungs, and no words to say. Here’s a story about my son Tanner when he was younger with a therapy dog that lived across the street. “I just came in from a party and the owner of this little dog named Gypsy almost cried telling me this story -she was so emotional about it. Gypsy is a professional therapy dog -not that I knew that before tonight. She told me that Gypsy instinctively knows if there is a person that has any type of problem and needs her. Typically Gypsy will run away if a person goes to pet her. She will not let people get near enough to pet her. This same dog however – with those in wheelchairs, or those who have a special need in some way -she will sit down and “scooch up to them” if they come near her -and do her tricks. There were a bunch of little kids playing on the street -including her 2, and my 2 (Dakota and Tanner) -and others as well. Just like I didn’t know that her dog was a therapy dog -she didn’t know my two boys -or that Tanner has apraxia. She went over and talked to Tanner and told her who Gypsy is and what her job is. At first Tanner gave her just simple one to three word answers -which then you can’t hear any of the apraxia. Then, because Gypsy was there – all of a sudden Tanner started “talking and talking and talking” nonstop and asking all these questions about Gypsy. It was at this time that she realized that even though Tanner sounded “normal” in short sentences -that he did have a speech issue in long sentences -and she realized that Gypsy knew it even though she would have never known if Gypsy didn’t lead her there. She told me that she couldn’t believe out of all the children running around that Gypsy went up to Tanner and just knew he needed her somehow. She told me she went into the house and cried. She again said to me -I had no idea. Well I guess Tanner can pass the people test -but he can’t pass the therapy dog test yet! Wow -how did this doggie know?” We’ve always had pets in the house including dogs, cats, fish, hamsters, a parrot, and in our backyard at one time a horse and a pony. To me a house isn’t a home without pets, and I saw firsthand how my boys who both had special needs when younger bonded with their various pets. 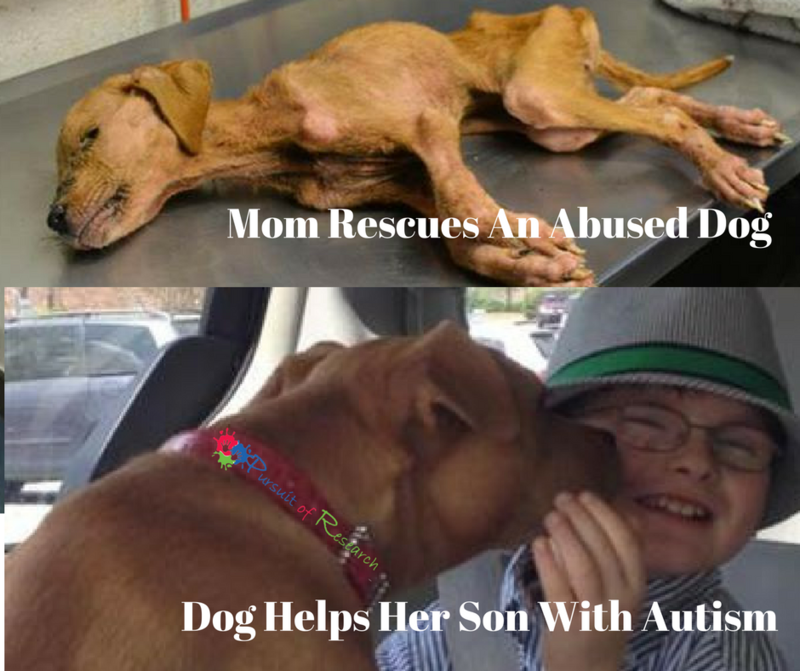 Xena the Warrior Puppy, rescued from abuse, helps 8-year-old boy with autism. From Today “…Then, about two months ago, everything changed. Jonny forged a connection so unlikely that people familiar with it describe it as a miracle. His new confidante brings out the best in him — his playfulness, his cute singing voice, his verbal assessments of everything he sees and experiences. Can animals literally hear special need that human’s can’t? There are therapy dogs for seizures which can detect seizures in humans, so I’m wondering if when one is going to have a seizure they exhibit some differences in brain waves that the dog is able to pick up. And if that is the case perhaps there are acoustic waves for other special needs? The choice of an appropriate animal-therapy program is largely dependent on the child’s likes and dislikes, as well as therapeutic needs. Doctors and therapists who are already working with a child may be able to suggest animal therapy to assist in the ongoing therapy. 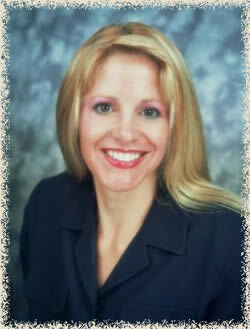 Issues such as allergies and fears, as well as costs, all play a part in decision-making. 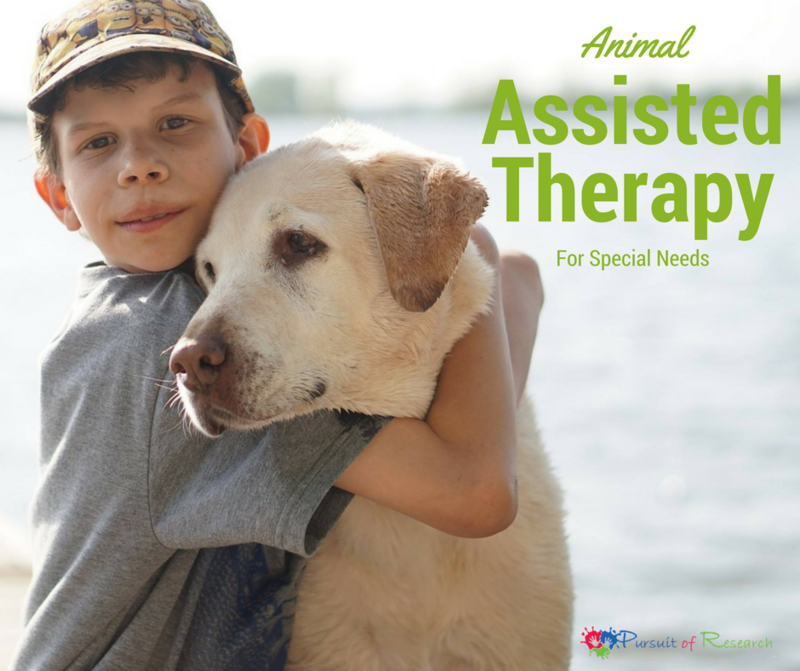 Dolphins, horses, dogs, cats and farm animals are the most common examples used for animal assisted therapy. Horses seem to have an affinity for and a healing affect on kids, say those involved in equine therapy programs. The use of animals to assist in therapy may go back centuries. There is evidence that horses were used for therapeutic riding in ancient Greek literature. But animal therapy as a practice is a relatively new phenomenon. Horses have been used continuously this century in physical therapy, especially for people who were paralyzed by injury or polio. But it wasn’t until the 1990s that standards were set for a clinical practice in horseback riding therapy, or hippotherapy. Dolphin therapy was pioneered in South Florida in the 1970s. The approach, using a romp with dolphins as a motivation to reinforce desired behavior, was developed by clinical psychologist Dave Nathanson working with a group of children with Down syndrome at the now-closed Ocean World in Fort Lauderdale. The program was honed and tested at the Dolphin Research Center in Grassy Key in the 1980s. Today, Dolphin Human Therapy is based at Dolphins Plus in Key Largo, but offered at many parks and lagoons around the world where captive dolphins live. The movie Paulie demonstrates animal assisted therapy could be with a parrot, and it’s a movie I highly recommend for the entire family if you have a child in speech therapy. 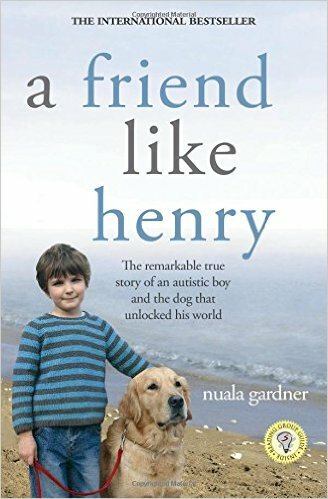 For children with special needs, the ability to interact with a dog, cat, (or parrot!) can have a very positive impact upon their quality of life. While there are numerous animal assisted therapy there is nothing like having one right in your home with a pet. Interacting with a pet a child can easily achieve a level of intimacy that teaches them the meaning of friendship. It’s this special bond that contributes to pets’ effectiveness as co-therapists. And one other reason for a pet if more encouragement is needed, a study found that children who live with dogs and cats are less likely to develop allergies to those animals later in life, but only if the pet is under the same roof while the child is still an infant. Find A Pet To Adopt!